Provide comfort for the family of Bombina Giorno with a meaningful gesture of sympathy. 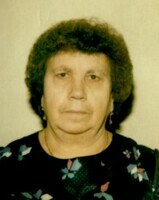 Bombina Giorno, 91, of Pierce Street, Westerly, passed away at the Westerly Health Center on Saturday, March 16, 2019. Born in San Giorgio, Italy she was the daughter of the late Nunziato and Rosaria Giorno. Bombina worked as a sander for Guild Musical for many years and was a devout communicant of Immaculate Conception Church. She is survived by five sons and three daughters, Ottavio, Domenic, Antonio and Vincent Giorno and Rosa Grillo all of Westerly, Frank Giorno of Germany, and Carmela and Filomena Giorno, both of Italy as well as her daughters-in-law, Maria, Asunta and Bonnye Giorno and son-in-law Romeo Grillo. Bombina also leaves her brother Natale Giorno of Westerly and one sister, Santa, living in Italy; nineteen grandchildren; and twenty-four great-grandchildren. She was predeceased by two brothers and five sisters. To plant a memorial tree in honor of Bombina Giorno, please visit our Heartfelt Sympathies Store. We encourage you to share your most beloved memories of Bombina here, so that the family and other loved ones can always see it. You can upload cherished photographs, or share your favorite stories, and can even comment on those shared by others.